President Mohammad Ashraf Ghani arrived in southeastern Ghazni province earlier today to review the security situation of the province. 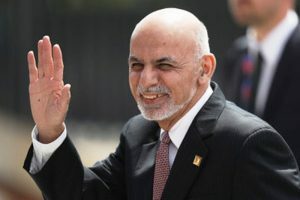 The Office of the President, ARG Palace, in a statement said President Ghani is leading a delegation of high level governmental officials during his visit to Ghazni. The statement further added that First Lady Rula Ghani is also accompanying President Ghani during his visit to the province. President Ghani will review the security situation of Ghazni during his visit to the province, ARG Palace added. He would also meet with the provincial governmental and military officials, religious scholars, influential individuals, school and university lecturers and teachers, women, youths, and members of the civil society. According to the statement released by ARG Palace, President Ghani would also participate in a major gathering during his visit to the province.